Costa Rican cuisine is known for being flavorful, yet fairly mild, with high reliance on fresh fruit and vegetables. 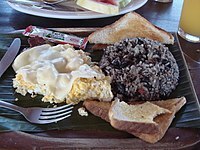 Rice and black beans are a staple of most Costa Rican meals, often served three times a day; they are known as gallo pinto when mixed together. For lunch, the traditional national dish is called a casado. It again consists of rice and beans served side by side instead of mixed. There will usually be some type of meat (carne asada, fish, pork chop, or chicken) and a salad to round out the dish. There may also be some extras like fried plantain (patacones or maduro), a slice of white cheese, and/or corn tortillas in accompaniment. Salsa Lizano is ubiquitous as a condiment and as an ingredient in cooking various dishes, including gallo pinto. In many family gatherings or for special occasions is very common to prepare Arroz con Pollo (rice with chicken) accompanied with aRussian salad, a salad made with beets, potatoes, hard boiled eggs and mayo. These two dishes are very popular in Costa Rican cuisine. In taverns, various small dishes (boquitas) are served which include patacones with black bean dip, chimichurri (tomatoes and onions pickled in lime juice) accompanied with tortilla chips, chifrijo (rice and beans with chicharrones, which are fried pork skins, and chimichurri), ceviche(fish and/or shrimp with onions and pickled in lime juice), and vigorón (cabbage, chimichurri, and yucca, served with a slice of lime). Fresh vegetables are a primary ingredient in most main dishes, and members of the squash family are particularly common. These include varieties such as zucchini, zapallo, chayote, and ayote. Potato, onion, and sweet red pepper are other common ingredients. The above vegetables are made into soups (sopas) which are usually made with beef or pork ribs as a base; also found in the soup will be corn on the cob, yucca, ñampi (a hairy root vegetable), and yam (camote). Costa Ricans as a rule do not like spicy hot food; some do, as you will find home-made “chileras” in restaurants which can be made withvinegar, carrots, onions, other vegetables and always habanero. Coffee and bananas are the two main agricultural exports of the country and also form part of the local cuisine. The plantain, a larger member of the banana family, is another commonly used fruit and can be served in a variety of ways. Ripe plantains (maduro) have a sweet flavor and can be fried in butter, baked in ahoney or a sugar-based sauce, or put in soups. Green (unripe) plantains can be boiled in soups or can be sliced and fried to make patacones. Sweet corn dishes are common traditional meals like pozol(corn soup), chorreadas (corn pancakes), etc. Other Costa Rican food staples include corn tortillas, white cheese and picadillos. Tortillas frequently accompany meals, but rice is nearly always present. Traditionally people should often fill tortillas with whatever they are eating and eat it in the form of a gallo (direct translation: rooster, resembling soft Mexican taco), although this tradition is less in use currently and many restaurants serve tortillas only when requested by the client. White cheese is non-processed cheese that is made by adding salt to milk in production. Picadillos are meat and vegetable combinations where one or more vegetables are diced, mixed with beef and garnished with spices. Common vegetables used in picadillos are potatoes, green beans, squash, ayote, chayote and arracache. Often, picadillos are eaten in the form of gallos. This is just the common and basic dishes, but we have a big variety, depend of the town, season and celebrations like Easter. The traditional breakfast drink, besides coffee, is called agua dulce (“sweet water“) and is made from tapa de dulce, an ingredient very similar to the American “brown sugar”. “Tapa de Dulce” is made with sugar cane juice which is boiled down in traditional trapiches and put to solidify in conical molds with the top cut off called tapas (“lids”). Then some of this tapa is scraped off and dissolved into boiling water or milk to make the agua dulce. Coffee is usually served at breakfast and during traditional coffee breaks in the afternoon, usually around 3:00 pm. It has traditionally been brewed in a native Costa Rican drip brew device called a chorreador. The traditional drinks for lunch are called refrescos or frescos for short and consist of liquefied fruits diluted in either water or milk and sweetened to taste. They come in many varieties such as melon, blackberry, strawberry, watermelon, mango, tamarind, passion fruit,guanabana, cas, and lemon or lime. Another popular drink is known as a granizado, a slush drink made of finely shaved ice and flavored syrup. The most popular flavor is kola. This is not the cola usually associated with carbonated soda, but a fruity cherry flavored syrup. It is usually served with evaporated and/orcondensed milk on top. The national liquor of Costa Rica, guaro, is made from sugar cane. Natives often drink guaro as a shot or mixed with juice or soda. The cost of guaro is very cheap compared to beer (cerveza) in Costa Rica which has only one producer. Imperial is the most popular beer and is an American-style lager that is also available in Light. Pilsen is a Bohemian style Pilsner produced in Costa Rica. During the 2007 holiday season, a 6.0 version with higher alcohol content was produced. Due to its popularity, production of Pilsen 6.0 was continued through mid-2008. At that point, it was replaced with Pilsen Red. It has a 5.2% alcohol content and a hint of red coloring. Bavaria is offered in Light, Dark or Gold. The Dutch beer, Heineken, is also produced in Costa Rica. Imported beers can be found in some markets, but are common only in parts of San José or larger tourist towns. Costa Rica produces an excellent rum: Ron Centenario and the Flor de Caña rums made in Nicaragua are also widely available. Potato salad is amongst the most appreciated dishes when the summer starts to appear. The uplifting bite of the potatoes which have just peaked in their growing season liberally smothered in a tangy sweet sauce. It’s making our mouths water just speaking about it.When you are captivated and want to start figuring out how to make potato salad for your next summer gathering, then follow along and we are going to show you how easy it is!.